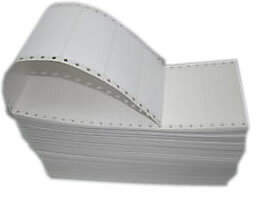 Have a dot matrix printer in your office that you use to print computer labels? Then you’ll need to make sure you have the right labels for it. These dot matrix labels are exactly what you need. The labels are specifically folded to work well with large mainframe printers. You can choose from a range of different label widths to meet all your labeling needs. These labels are packed in a fanfold format ensuring smooth feeding through the printer. Dot matrix labels in continuous fanfolds with a wide range of sizes and width formats. Austab keeps the most popular sizes of computer labels on the shelf for immediate dispatch.